Welcome to the interactive timeline of Whitesell history! Travel through time with the interactive timeline below. James P. Whitesell, working as Whitesell Construction, began building single family homes in Burlington County in the early 1950's. The business was a family affair operating out of the Whitesell household. Louise Whitesell, oversaw company bookkeeping and administration while husband Jim and his construction crew built homes in the area. Their son, Tom, worked on the projects when not in school and eventually came on board full-time to help run the business with his father. As testament to the quality and aesthetics of the homes, many can be seen today looking very similar to when they were originally constructed. While constructing single family homes, Jim Whitesell was also developing commercial facilities for companies in the Cinnaminson area. 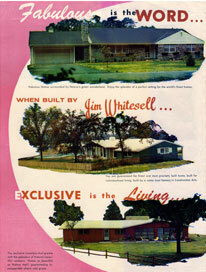 In the period between 1956 and 1963, Whitesell constructed approximately twelve properties which were ultimately sold to end users. In 1958, Jim started work on the Flying "W" Ranch, a family oriented recreation venture orchestrated by he and Bill Whitesell (brother), which included an airport, hotel, restaurant, barn and swimming pool. The Flying W featured a challenging 18-hole golf course and an Olympic size airplane-shaped swimming pool with lifeguards on duty, in addition to a "chuckwagon" snack bar and large playground for kids. Adults could enjoy lawn games, shuffleboard, or lounge poolside while the kids played. Additionally, the Flying W Stables offered mounts all year round with expert riding instruction, horse boarding, scenic trails, pony rides for children, ranch wagon tours, and moonlight hay rides for kids. Two large dining rooms featured cocktail lounges with food and bar service all year round. 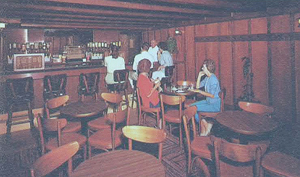 One cocktail lounge called the "Longhorn Lounge" served "the finest in refreshments day and night." Entertainment was provided in the "Frontier Room Piano Bar", where people could listen to music and meet people from "just about everywhere." And Laughrey's Trading Post was said to promise something a little different, and new for restaurant goers. 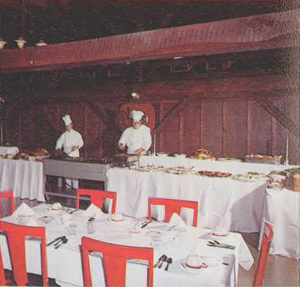 For executive and sales meetings, banquets, luncheons, and other private affairs, the rustic upstairs "Wagon Wheel Room" offered an "exciting western atmosphere of planes and people" enabled from its view that overlooked the runways and airplane shaped pool. 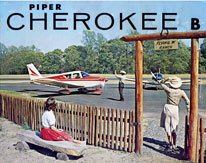 Onsite at the Flying "W", accommodation was provided at the "Ponderosa Lodge." The lodge had 28 room suites which were reproduced from Virginia City, Nevada style architecture of the 1860's. The Ponderosa Lodge's two-story construction featured balconies on the front and back, and was situated amongst the evergreens. In its time, the Ponderosa Lodge boasted accommodations such as TV's tuned to New York channels, radio, individual controls for heating or air-conditioning, telephone, and free ice, amongst the convenience of "to door parking." The Flying W was truly an original that Bill and Jim Whitesell dreamt and brought to life. 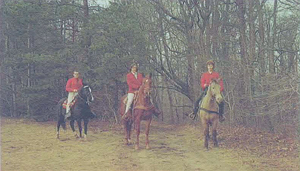 The ranch was surrounded by excitement that included dignitary travel from people such as Richard Nixon, actor Bob Cummings, and perhaps most notably The Beatles in the early days of their career. The Flying W is no longer owned or operated by the Whitesell Family; however, its spirit is carried on through John and Dawn Cave's ownership & management who run a great operation, provide flight & dining services to the aviation community and public, and continue in the spirit of flight. In 1964, Tom Whitesell bought the company from his father Jim. In the years that were to follow, Tom continued along the original path as a residential and commercial contractor; however within a few years, he started to turn in the direction of developing larger industrial facilities and discontinued residential construction. 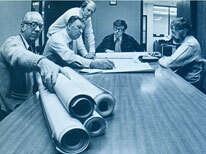 During the mid-1960's through early 70's, Whitesell Construction through the leadership of Tom Whitesell, continued developing industrial facilities in Burlington County and began to lay the groundwork of the build-lease business model by maintaining ownership of its real estate, a model of which is still in place today. 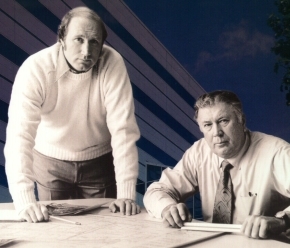 In 1972, Tom began construction of the first of three buildings in Cinnaminson which were built and owned by Whitesell, and designed to be leased to small business owners. This laid the foundation for the company's current path. 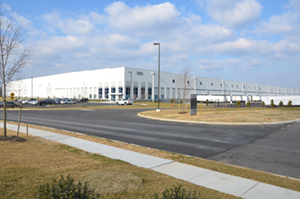 The success of the build-lease model led Tom to construct additional facilities, of various sizes to accommodate different users, in Burlington County. As the build-lease model idea was implemented, the idea of developing a master-planned business park to appeal to the business community and local municipalities was born. 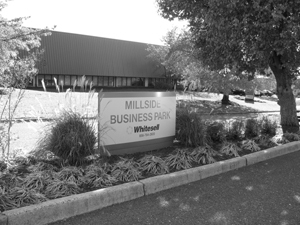 The first master-planned business park for Whitesell would be Millside Business Park in Delran, NJ. Here, as with many more corporate parks thereafter, Whitesell would perform all phases of development including civil engineering, site planning, architecture, construction, property management, and leasing. Through the development of a master planned center, Whitesell could create an aesthetically pleasing and functional environment incorporating attractive landscaping, site lighting, broad boulevards, amidst buildings for lease without significant impact to the residential community. 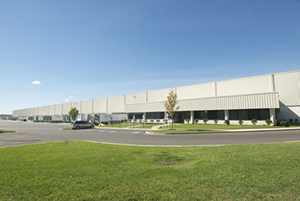 Located in Delran with easy access to major highways and bridges, Millside Business Park initially featured six facilities which were constructed and offered for lease to accommodate various companies. While Whitesell had developed at least a dozen facilities up to this time for lease in clustered locations, the master-planned park environment was a first for Whitesell. 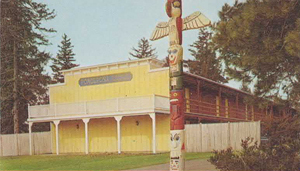 Construction of buildings for lease at the park would occur from the mid-1970's to mid-1980's. The success of Millside Business Park drew interested parties to locate in the park and a few additional facilities were constructed for other property owners. An interesting project for Whitesell during this time at the Park was the construction of the Millside Racquet Club in 1974. This recreation facility was completely fabricated at another location and assembled at the park. In 1975, Whitesell ventured outside of Cinnaminson and Delran Townships and constructed a number of facilities in Burlington, Edgewater Park, Medford, Mount Laurel, Moorestown and Pennsauken; some for its ownership and some for other parties. Build to suit for sale projects included several car dealerships in Burlington County. During this time period, Whitesell also completed its first retail shopping center in Delanco as well. In the mid to late 1970's, Whitesell continued on its course developing commercial facilities in Burlington, Camden and Gloucester Counties, some to be owned by others and a number to be added to the Whitesell portfolio for lease. 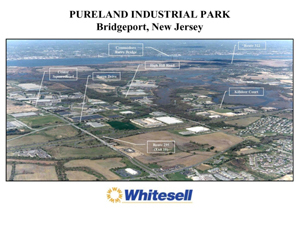 One of the development locations Whitesell ventured into was the Pureland Industrial Park in Gloucester County. Whitesell was a pioneer in Pureland's development with eight of the first nine structures designed and built by the company at a time before the Commodore Barry Bridge was in place. 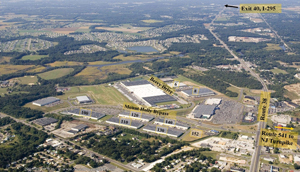 The center is now one of the largest business parks on the east coast spanning 3,000 acres in Gloucester and Salem Counties. Whitesell currently owns and manages six buildings comprising more than one half million square feet of industrial space in this vibrant business center. In the early 1980's, Whitesell also crossed the Delaware River into southeastern PA, and began construction of a four building complex within the Keystone Industrial Park in Bristol, Pennsylvania. This multi-building 400 acre park includes facilities owned and operated by others. During the mid to late 1980's, Whitesell's development of a 140 acre master-planned office park called the Laurel Corporate Center in Mount Laurel, NJ brought major attention to the company. 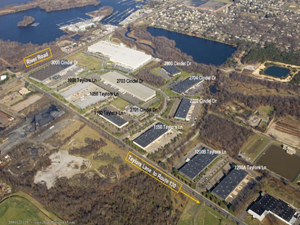 Laurel Corporate Center began with Whitesell's purchase of the existing Zurich America facility at 4000 Midlantic Drive and the Duff farm consisting of 84 acres of prime land at the major intersection of I-295 and Route 38. Over the next several years, Whitesell went on to build ten additional multi-tenant office buildings at the business campus. The park received high acclaim for its location, aesthetics, and amenities whereby the 6000 and 8000 Midlantic Drive buildings were awarded the "Building Excellence Award of the Delaware Valley", the "New Good Neighbors" award by the New Jersey Business and Industry Association, and "Best Mid-Rise Office Structure" by the Builders League of South Jersey. The awards were based on the criteria of economic impact on the local community, aesthetics of the buildings and corporate involvement in local activities. The 10000 Midlantic Drive facility was also awarded the Tri-State Building Excellence Award for Suburban Commercial/Office Facility by Commerce Bank. In the mid 1980's, Whitesell master planned and began development of the Cindel Business Park in Cinnaminson and Delran Townships. Over the next ten years, Whitesell would build twelve buildings and sell a large build to suit facility to an end user at this center. Cindel Business Park was master planned and built by Whitesell to appeal to end user demands for a distribution and manufacturing location in an industrially zoned campus which featured higher clear heights, wide bay spacing, and ample loading accommodations over the existing commercial real estate in the marketplace. 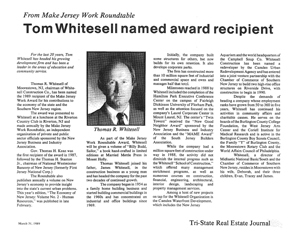 Whitesell's reputation as a developer and property manager continued to grow outside the boundaries of southern New Jersey and into the Delaware Valley during the late 1980's and early 1990's period. Amongst the projects included a 300,000 square foot, high security office building for General Electric's involvement in the "Star Wars" program. The building was located in the heart of Lockheed Martin's regional complex in King of Prussia, Pennsylvania. In addition to the building's sharp lines and contemporary look, Whitesell worked with GE to create a building which included 100,000 square feet of high security SCIF space, an eight foot diameter underground tunnel inter-connecting the communication links with other GE buildings, and one which met strict government standards. Also designed and developed at the time in King of Prussia was a 112,000 square foot ultra-modern contemporary office building (photo above) which featured wide flange columns and rolled structural steel beams and girders with a two-way aluminum framed silver reflective insulated glass curtain wall system. Whitesell would ultimately sell both of these buildings. 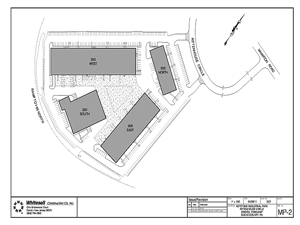 Whitesell's diversification as a developer/manager would be further exemplified by its construction of a 126,000 square foot retail center In Mount Laurel and the design/build of the former Commerce Bank headquarters office building in Cherry Hill amongst other projects during this period. During this time period, Whitesell's staff had grown to exceed over 550 personnel performing all phases of development and management, with over two hundred personnel in engineering and architecture alone. As a testament to the area growth and Tom's vision, Tom Whitesell was honored to receive the "Make Jersey Work" Award sponsored by the New Jersey Business and Industry Association. Tom Whitesell, New Jersey Business and Industry Association - 1989 "Make Jersey Work Award"
Additional awards were received by Tom Whitesell and Whitesell Construction for their progressive work and contributions to the community during this time period. Some examples included Tom receiving the "Distinguished Citizen Achievement Award" from the Southern New Jersey Development Council for his contribution to the economic development and growth of the region in 1986. During the same year, Tom also received the Award for Outstanding Conservation Achievement by a Land Developer by the New Jersey Association of Conservation Districts. In 1987, Tom Whitesell received the 1987 Whitney Award for Selfless Leadership presented by the Cherry Hill Chamber of Commerce. Tom Whitesell was also honored with the 1991 "Quality of Life" award sponsored by Businesses Committed to Burlington County. In the mid-1990's, while development had slowed in the area, Whitesell continued building at its business parks. In 1996, Whitesell built a 250,000 sq ft industrial building on speculation because the company believed there was a void in the marketplace for this type of rail-served product. This led to the development of the Ball Corporation's manufacturing facility at Cindel Business Park. Whitesell's relationship with Ball began in 1996 when they were looking for a suitable facility for their Northeast Distribution Center. 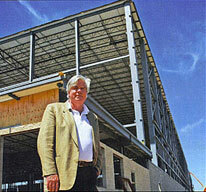 Whitesell stood poised with the only Class A Industrial Building in the area. Built on speculation because Whitesell felt there was a void in the marketplace for this type and size of structure, Ball came to Whitesell with a need to meet a very ambitious schedule. With 250,000 square feet already built at that time, our vision of possible expansion was utilized to enlarge the structure another 200,000 square feet. It boasts a forty-foot maximum clear height in the warehouse, primary electrical substation, and rail-service to the facility; one can only imagine the intensity and appreciate that this project was completed within six months of contract signing. This facility was capable of producing one billion bottles a year. In 1998, Whitesell purchased 660 acres of land in Burlington and Florence Townships from an oil company based in Houston, Texas. 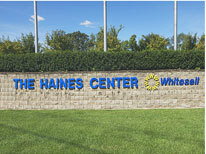 The vacant land would ultimately become what is now known as The Haines Center, an award winning master-planned corporate campus providing state of the art warehouse facilities to some of most prominent distribution operations in the northeast US due to its location, infrastructure, and modern warehouse structures. During that same year as Whitesell's purchase of the property, Burlington County, in cooperation with twelve municipalities, completed a revitalization plan for the Route 130 Corridor identifying several key projects that could act as a catalyst for change and revitalization to capture some of the surging suburban growth and economic vitality that moved away from the "Corridor". Cited for its tremendous potential for general light and industrial uses with its location at Exit 6A of the NJ Turnpike and Interconnector to the Pennsylvania Turnpike, in addition to a future onsite NJ Transit RiverLine Commuter rail stop in Florence (now in place), the Haines Center lent itself to accessing the vast regional labor market from Trenton to Camden. Construction commenced at the Park with the first facility: a 500,000 square foot warehouse at 400 Richards Run. This building joined other adjacent existing Whitesell facilities, 1817 Route 130, 300 and 700 Richards Run that Whitesell had constructed in prior years. 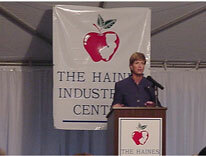 In 2000, a dedication ceremony of the Haines Center occurred at 400 Richards Run in the memory of Senator William Haines with Governor Christie Whitman and other dignitaries in attendance. Dignitaries spoke fondly of the late Senator with recollections of his positive influence and guidance that he provided. As the only farmer in the legislature, Senator William C. Haines provided a simple, direct, and realistic viewpoint. With this philosophy, he initiated the State's "Jersey Fresh" program, legislation which preserved green space around the state through purchase of development rights, and was the prime sponsor of legislation that created the Transportation Trust Fund which brought more than 700 million dollars a year in state and federal funds for transportation projects in New Jersey. He was also involved in the development of the NJ Transit RiverLine in an effort to revitalize river front communities and provide public transportation between Camden and Trenton. In 2001, The Haines Center, was awarded the "New Good Neighbor" Award by the New Jersey Business and Industry Association as it was cited as one of the key projects providing a catalyst for a multi-township strategic plan to revitalize the Route 130 corridor. 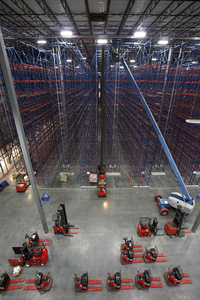 It was during this year that Whitesell completed a 633,000 square foot build to suit project for BJ Wholesale's East Coast Distribution Center. The $35 million dollar project represented a major building block for revitalizing the Route 130 Corridor. The facility was completed within a year of contract signing; an amazing feat due to the collective effort of many dedicated people. The building's size, equivalent to 13 football fields and unique "T" configuration, allows for inventory to be stocked to a minimum of 30' clear height, then shipped, and received through the building's cross-dock area of 227 tailgates. The building also features parking for 700 trailers. 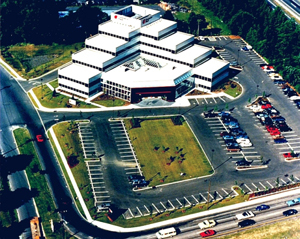 In the early 2000's, Whitesell moved forward with the development of a corporate park called the Burlington County Business Center in Lumberton and Hainesport Townships to address county growth heading eastward. Whitesell started construction at the first of four flex facilities, approximately 80,000 square feet in size at the Mount Holly By-Pass in Lumberton. These buildings would add to existing Whitesell facilities at the site to create the Burlington County Business Center. The park would ultimately feature modern warehouse, flex office, retail, and professional buildings at the crossroads of NJ Route 38 and County Route 541 (the Mount Holly Bypass). These buildings now represent the modern standard of exceptional flex facilities and user needs for wide bay spacing, high clear heights, skylights, modern mechanicals, and ample loading opportunities. In 2001 - 2002, Tom Whitesell and the Whitesell Family were recognized in the local community for business and philanthropy efforts. 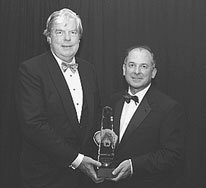 Thomas R. Whitesell was awarded the 2000 Voice of Business Award sponsored by the Burlington County Chamber of Commerce and in 2001, the Whitesell Family was awarded "Family Philanthropist of the Year" honor from Family Service of Burlington County for fund raising efforts and generosity. 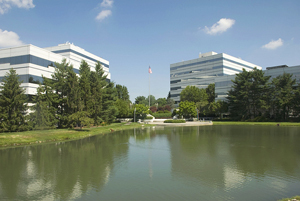 From 2003 - 2008, Whitesell master-planned and developed a five building, office park campus called The Laurel Creek Corporate Center for Lockheed Martin Corporation in Mount Laurel, New Jersey. The 47 acre campus was designed to create a highly functional corporate environment in concert with a lush exterior landscape. The campus features four ponds, waterfalls, and walking paths amongst five technologically advanced, Class A office buildings and was designed this way to attract the best engineers in the defense industry for Lockheed Martin. In 2007, the center was awarded the NJ Business and Industry Association's "New Good Neighbor Award" based upon the project's economic benefit, job creation, architectural merit, and community involvement. During this time period, Whitesell also completed the Moorestown Commons Shopping Center in conjunction with Metro Commercial Real Estate. In 2007 & 2008, Whitesell completed several large scale projects at The Haines Center in Burlington and Florence Townships for large end users seeking suitable locations for their operations. Rick Cureton, 270 Daniels Way, "The CTS Building"
One such project was the unique 68 foot clear, 721,000 square foot design/build project for The Christmas Tree Shops (owned by Bed Bath and Beyond) in Florence, NJ. 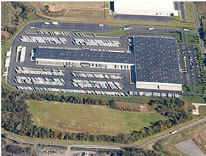 This project was a finalist in the 2007 New Jersey - NAIOP "Economic Impact Deal of the Year Award" in 2007. 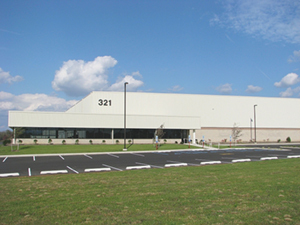 Another completed project was International Paper's Northeast Regional Distribution Center at 1500 John Galt Way. International Paper combined rail and truck (intermodal) transportation at the facility ultimately reducing fuel consumption and impacts to area roads through The Haines Center's Norfolk Southern/CSX rail service from freight car yards in Camden and Perth Amboy, NJ via the Bordentown Secondary Rail line. A rail spur brought to the building from the Bordentown Secondary Line enabled direct freight shipping and delivery to / from International Paper's facility. Rick Cureton & Tom Heitzman - NJ-NAIOP "Impact Award" on behalf of Whitesell Construction. The Impact Award was presented to Whitesell at the 21st annual Commercial Real estate Awards Gala for its significant contributions to New Jersey’s commercial and industrial real estate development industry. As one of the NJ’s largest and most influential annual real estate industry calendar events, the gala was held at the New Jersey Performing Arts Center in Newark and attended by over 1000 persons. In June of 2011, Whitesell was honored to receive the Lifetime Achievement Award from the Businesses Committed to Burlington County (BC2). Businesses Committed to Burlington County (BC²) was founded to promote the common good and general welfare of the members of the Burlington County community by focusing on the orderly development of the commercial/industrial and residential climate of Burlington County, insuring that the highest standards of quality are maintained, mainly through educational, public relations and promotional events. In 2015, Whitesell received two “New Good Neighbor Awards” from the New Jersey Business and Industry Association for major build to suit projects completed at the Haines Center in Burlington and Florence Townships. The annual New Good Neighbor Award is sponsored by the New Jersey Business and Industry Association (NJBIA) to recognize organizations who have enhanced the business environment of New Jersey by creating new or renovating existing commercial properties. An independent panel of judges selected Whitesell projects located at 250 Daniels Way in Burlington Township, a 677,815 square foot build-to-suit project for Burlington Stores, and 1000 John Galt Way in Florence Township, a 406,375 square foot build-to-suit project for Destination Maternity Corporation based upon the projects’ economic benefits, job creation, architectural merit and community involvement. Both Haines Center projects were cited for being located in an exceptionally maintained, master-planned industrial development. Additionally, Destination Maternity Corporation was recognized as a LEED Silver-compliant project. 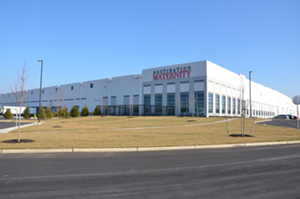 Ideally situated at New Jersey Turnpike Exit 6 and the Pennsylvania Turnpike connector, the Haines Center enables Burlington Stores and Destination Maternity to reap competitive advantage gained from same day delivery to a 25-30 million person market area while their employees benefit from being within walking distance of the onsite New Jersey Transit RiverLINE Florence station. In 2015, Whitesell was honored to receive the Burlington County Regional Chamber of Commerce’s annual “Voice of Business Award”. 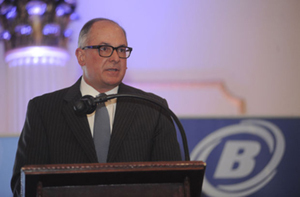 Thomas Heitzman, president of Whitesell Construction Co., speaks after receiving the 2015 Voice of Business Award from the Burlington County Regional Chamber of Commerce. 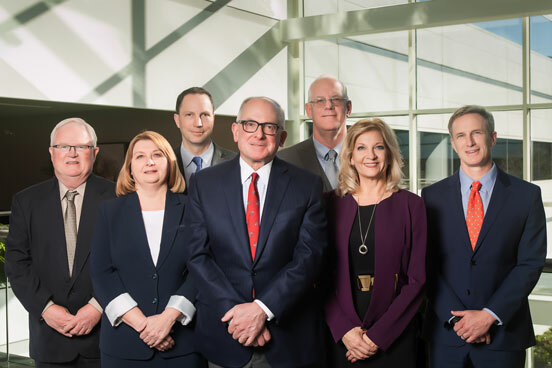 The “Voice of Business Award” recognized Whitesell as an outstanding business in Burlington County who demonstrated a long-term commitment to the economic development and the enhancement of opportunities in the county and beyond. Whitesell’s active community involvement, including participation in a wide variety of business, civic and charitable organizations, earned the company this recognition from the Chamber. The Burlington County Regional Chamber of Commerce is a partnership of leading businesses, governmental agencies, and non-profit organizations working to improve the economic viability of Burlington County. 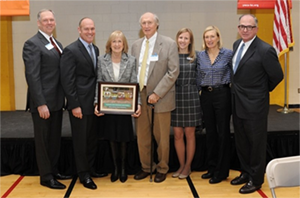 In 2015, Thomas and Deborah Whitesell were honored to receive the YMCA of Burlington and Camden Counties "Lifetime Impact Champions” award for their longstanding commitment to the community. In the commercial real estate management and development world, Whitesell recognizes a balance exists between sustainable business practice and providing tenants tangible results. Whitesell's efforts to continually improve upon our corporate parks and building environments have been in place for many years by virtue of a commitment to long term ownership and providing an exceptional product, but we realize as a business owner that innovations must have tangible benefits to our customers. When customers can truly benefit from "green" innovations in the form of lower operating expenses and more comfortable working environments, we've met our pledge towards environmental stewardship and producing results for our tenants. As testament to this philosophy, Whitesell has committed major investments into our buildings over the past several years to make them more efficient and environmentally friendly. We recently invested in excess of $5 million towards the replacement of all our office building HVAC systems with new energy efficient equipment employing state of the art energy management controls. The systems allow technicians' access to demand data shown in "real-time" enabling the ability to make adjustments 24/7. Variable frequency drives (VFD) and multi-staged compressors have been implemented to reduce part-load energy consumption in addition to equipment operation initiated on a staggered time schedule to lower peak demand rates at buildings. Since our implementation of these capital improvements at our buildings, tenants have enjoyed lower electric fees than several years ago, all while electricity costs have increased in the marketplace. Additionally, Whitesell purchases electric through a third-party supplier to ensure the lowest utility rates possible for our office buildings. A great challenge to efficiently heat warehouse environments is relative to temperature stratification (the temperature at the ceiling deck versus the floor). 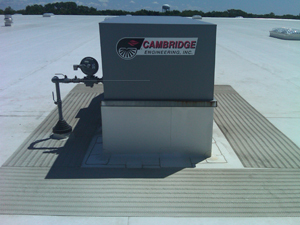 We've always looked to properly size our HVAC equipment to their respective clear height environments and have recently installed Cambridge heating units in our 30' clear ht. warehouses. The units directly pull 100% outdoor air and push high temperature, high velocity air downward in three directions effectively reducing temperature stratification. Business owners operating in large footprint buildings with high clear height warehouse environments not using Cambridge or Johnson air rotation units are likely experiencing 85 degree temperatures at the ceiling and 65 degree temperatures at floor level with equipment that cannot keep up with the demand during our winters. Temperature stratification costs business's money, makes undersized equipment work harder, and reduces air circulation benefits to employees. We have also actively participated with our tenants in public utility incentive programs to replace older equipment with newer, more energy efficient equipment. In efforts to deliver more energy efficient lighting systems in warehouse and office environments throughout our portfolio, we've installed reflector plates in fluorescent fixtures which generate the same amount of light with half the wattage requirement, we've installed light motion sensors in various warehouses and the common areas of our office buildings, we've replaced metal halide fixtures with high-bay fluorescent lamp lighting in warehouses, provide multiple lighting switches for warehouse fixture zones to increase efficiency opportunities, and we've been active participants in public utility programs to replace older fixtures with newer more energy efficient equipment. We're also glad to work with our tenants in retro-fit programs since they're ultimately the beneficiaries of lower utility bills resulting from these upgrades. Whitesell has recently participated in LED lighting retro-fits with several tenants at our warehouse buildings which have produced brighter indoor environments and a significant reduction to their electric costs. In the realm of keeping things cooler in warehouse and office environments, we have recently installed Thermoplastic TPO mechanically fastened roofing systems at several of our buildings. 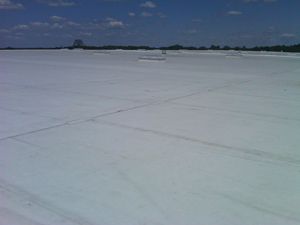 The roofing material is white instead of the typical black rubber roof membrane thereby providing reflective characteristics to reduce solar heat gain and maintaining cooler indoor air at the ceiling level. We recently completed TPO roofs at 6000 & 8000 Midlantic Drive, 3000 Cindel Drive, 11000 Midlantic Drive, 321 Dultys Lane, 1500 John Galt Way, and 290 Daniels Way. We have converted over 1.1 million square feet of rooftops to date into this roofing system. We have upgraded all lawn irrigation systems with controllers to properly manage water consumption. Additionally, we have taken to limiting irrigation to high profile areas. The balance of a site utilizes drought tolerant non-irrigated plant materials to reduce water consumption. Our stormwater management systems are designed to minimize sediment and pollutants which might run-off sites and enter local watershed areas. Additionally, soil erosion and sediment control precautions are always taken during construction to minimize erosion and sediment deposited in nearby streams. We have retrofitted office building bathrooms to include faucets and urinals with sensors significantly reducing water consumption. 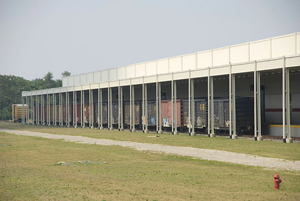 Many of our warehouse buildings employ "daylighting" features. The combination of warehouse skylights, white interior walls and ceilings provide high reflectance qualities enabling greater lighting efficiency and energy savings. On a sunny day, a good number of businesses at our buildings can operate without their warehouse lighting fixtures turned on. The recently coined green term of "daylighting" has been a part of Whitesell buildings for over forty yearsâ€¦.it has always made good sense. We separate & recycle all concrete, metals, wire, electric ballasts, and light bulbs at our job sites. We also recycle white paper, cardboard, glass, aluminum, and light bulbs at our office buildings. We make every effort to use low VOC emission products in all of our tenant fit-outs and buildings to insure a safe indoor environment for our tenants. Additionally, the majority of carpet, vinyl composition tile, and other materials used at our buildings are made from a percentage of recycled materials. We make best efforts to purchase products made in the USA. The 406,375 square foot build-to-suit LEED Silver compliant project for Destination Maternity included tilt-up concrete panel construction, white thermoplastic roof, 4000 amp electric service, fluorescent high bay lighting fixtures with motion sensors, ESFR fire suppression system, upgraded warehouse insulation, LED site lights, a central computer controlled HVAC management system, high-efficiency HVAC equipment, bicycle storage and changing rooms, special parking for low emitting and fuel efficient vehicles, and low-volume water closets. 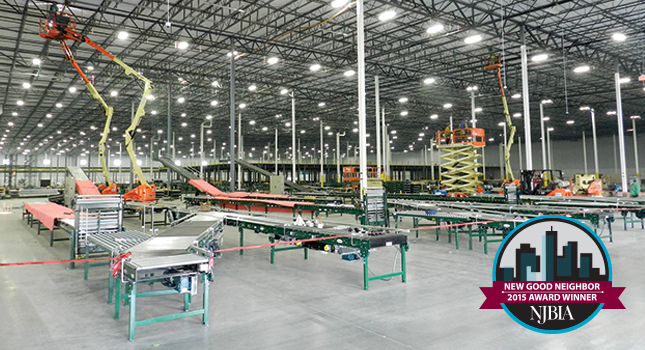 The 677,815 square foot build-to-suit project for Burlington Stores, Inc. enabled the company to grow into a state-of-the-art distribution center with greater space and new material handling equipment to increase its capacity and efficiency of operations. Notable features at 250 Daniels Way include tilt-up concrete panel construction, white thermoplastic roof, 4000 amp electric service, fluorescent high-bay lighting fixtures with motion sensors, ESFR fire suppression system, high-efficiency HVAC equipment, secured truck court area with guard house, and site expandability to accommodate Burlington Stores future growth. White Roof: The Thermoplastic TPO mechanically fastened roof system has reflective characteristics which reduce solar heat gain. Skylights: Provide daylighting for lighting efficiency and energy savings. White Interior Paint: White walls and ceiling in warehouse provide high reflectance for lighting efficiency and energy savings. Energy Efficient Lighting: T-5 fluorescent warehouse light fixtures with motion sensors for energy efficiency; energy efficient fluorescent office lighting. 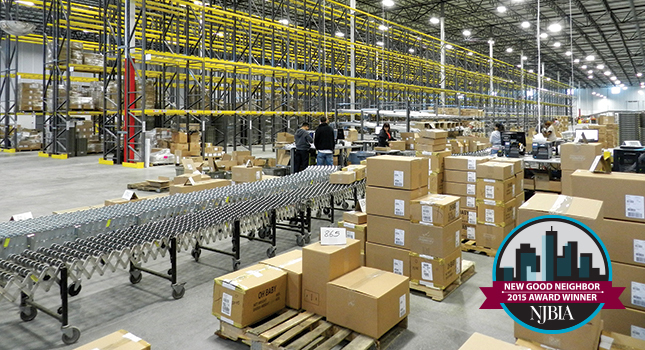 Multiple Light Switching: Multiple light switches throughout the warehouse increase energy efficiency opportunities. Insulated Dock Doors: Insulated dock doors with weather seal and trailer seals reduce air infiltration. Rail Spur (1500 John Galt Way): International Paper combined rail and truck (intermodal) transportation at the facility ultimately reducing fuel consumption and impacts to area roads through The Haines Center's Norfolk Southern/CSX rail service. Commuter Rail Service: Close proximity to NJ Light Rail and Bus stops reduce traffic congestion and potential fuel consumption for employees. Stormwater management systems are designed to minimize the sediment and pollutants that run-off the site and enter the creek. The proximity of the Haines Center to major metropolitan areas and highway systems minimize employee and freight transportation costs (fuel). Approximately forty percent of the Haines Center will be preserved for ecological purposes. The plans include soil erosion and sediment control precautions to be taken during construction to minimize erosion and sediment deposited in nearby streams. Whitesell Construction Co., Inc. has grown, expanded and diversified over the last half century, but continues to maintain the core philosophy of product quality, service to tenants, responsibility to the community, and sound planning for the future. Whitesell currently maintains its position as an innovative leader in the commercial market and looks forward to further success. Quality endures.